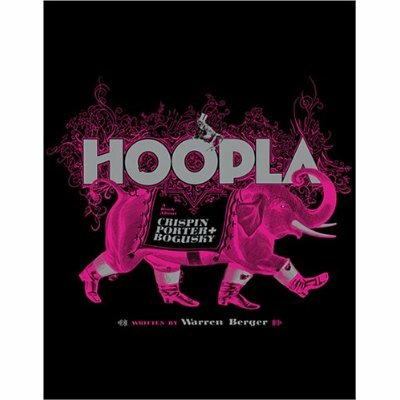 With the recent Microsoft ad campaign launch and news that Alex Bogusky will be authoring a diet book, i thought it was a good time to revisit the book by Crispin Porter Bogusky – “Hoopla”. Originally released in late 2006, the book written with Warren Berger provides an inside look at the philosophy and work of the agency. At 432 pages, the book seems big, but includes a lot of pages filled with images of their work, so it’s not a long read. The takeaway is in the sections (Mutation, Invention, Candor, Mischief, Connection, Pragmatism, and Momentum) and how Berger relates each to advertising with quotes and campaign examples from the agency. Two other interesting notes on the book are the agency’s interest in P.T. Barnum and the translation of “Hoopla” to what they try to accomplish with advertising; and the intro internal emails that are showcased – one in particular by Bogusky to his team about the vision for the agency. The book speaks of a concept called “Hooplanetics”, and inside the back cover (you have to cut it out) you’ll find a short workbook on it. This was to be followed by a longer version for sale in early 2007, but was consistently pushed back and finally pulled.